How Long Do Fire Extinguishers Last? - Keystone Fire Protection Co.
Fire extinguishers can be your first defense against a fire in your business. If the time comes when you need to use your fire extinguisher, you want to be confident that it is going to work properly and efficiently. Unfortunately, not everyone realizes that fire extinguishers require regular maintenance. If left in storage for too long, fire extinguishers will no longer work to their fullest potential. With this guide, you will learn everything you need to know about maintaining fire extinguishers so they will always be ready when you need them. How many years is a fire extinguisher good for? It may surprise you that fire extinguishers will not last forever. A fire extinguisher is no longer “good” when the chemicals within the extinguisher lose their charge, or when the pressure of the contents has fallen. The exact shelf life of every fire extinguisher varies from manufacturer to manufacturer and whether it is rechargeable or disposable. According to the National Fire Protection Association (NFPA) standards, rechargeable fire extinguishers must be recharged every 6 years, whereas disposable extinguishers must be replaced every 12 years. You can tell the difference between the two by the head; a rechargeable extinguisher has a metal head with a gauge that reads Charge/Recharge, and a disposable extinguisher has a plastic head with a gauge that reads Full/Empty. How do you know if a fire extinguisher is still good? There are a couple of things you can do every month to make sure that your fire extinguisher is fully functional. Most fire extinguishers come with a pressure gauge that indicates the pressure level of the internal contents. If the gauge needle falls too low (you can tell if it is outside the green zone on the gauge), you know it’s time to replace your extinguisher. Similarly, most devices also have an inspection tag or sticker that will list the maintenance and service history of the extinguisher. An extinguisher that has not been recently serviced should also be inspected and possibly replaced. If your extinguisher is missing either a pressure gauge or an inspection tag or sticker, it should be serviced and/or replaced as well, as it is nearly impossible to tell if it is still properly working. Finally, any signs of damage or loose pieces is another indication that your fire extinguisher is no longer good. Is there an expiration date on fire extinguishers? Many fire extinguishers don’t have a specific date threshold that identifies when the device has expired. The life of a fire extinguisher can change depending on how well it has been maintained and cared for over time. However, even the most cared for fire extinguishers will not last forever. It’s important to know when the extinguisher was built, as well as the manufacturer’s recommendation for replacement. How do I know if my fire extinguisher is expired? Typically, if a fire extinguisher has been in a household or office for more than fifteen years, there’s a good chance that the device has “expired” and needs replacement. However, you might not be sure how old the device is or when you received it. One place to check is on the label or on the bottom of the extinguisher for the manufacture date. 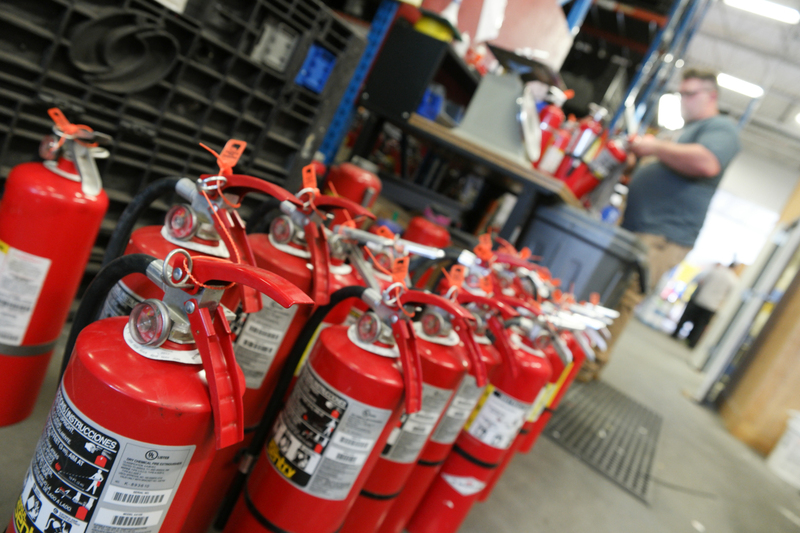 If the extinguisher has been manufactured within the last fifteen years, the next best clue to help you determine if the extinguisher is still operational is how recently it has been serviced and the level of wear and tear. In short, maintenance inspections should be completed every year and should be performed by a fire safety specialist who has the proper tools and adequate training to be able to identify any shortcomings in the fire extinguisher. Furthermore, fire safety specialists will also be able to repair or replace any aspects of the extinguisher that have failed inspection. In addition to an annual inspection, it is also recommended that internal maintenance of a fire extinguisher occurs every five or six years, depending on the type. In this inspection, a Keystone pre-engineered technician ensures that all the contents of the extinguisher are properly pressurized and will discharge appropriately. To ensure that your fire extinguishers are working properly and ready for an emergency, get them checked by Keystone Fire Protection Co. Keystone offers inspections, tests, and repairs for fire extinguishers, fire systems, and alarm systems. Contact us today at 888-641-0100 or email us at [email protected]!